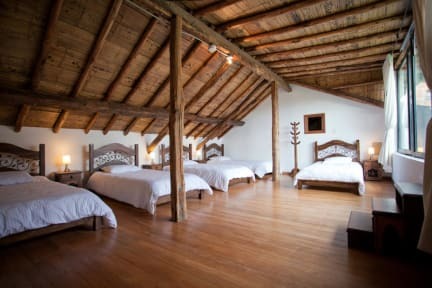 Arche Noah Boutique Hostel kohteessa Bogota, Colombia: Varaa nyt! 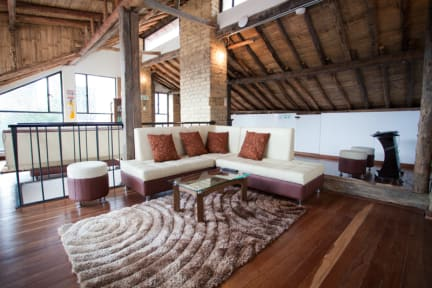 A stylish boutique and colonial hostel in Bogota’s prime location – Candelaria, the old town and a world heritage site. A 5 minute walk to Monserrate and tourist attractions such as Plaza Bolivar and museums. Dozens of restaurants and bars right on our doorstep. We are an oasis of tranquillity, a home away from home, rated by couples and independent travellers that like to socialise. Co-owned by Dutch, English, German-Swiss, Colombian and Australians with a wide knowledge of Colombia, we provide an international welcome in your language for guests to embrace local culture with a variety of events and activities. Experience style and exclusivity in Arche Noah, a hostel with a difference at a competitive price, where quality and privacy combine with culture and heritage. Enjoy a premium experience with a roof terrace BBQ with spectacular views over the city, a spacious lounge, furnished apartment, private en-suite rooms, luxurious dormitory, sauna and kitchen. Open 24hrs, services include free WIFI, free breakfast, free towels, free luggage storage, free coffee all day, lockers and a laundry and taxi service to the airport only 15km away. The ARK is a safe haven protected by high tech security cameras and key pad entry to ensure you have a peaceful stay. Choose to socialise with guests in our luxurious lounge, at one of our events, book a tour or just enjoy tranquillity before walking Candelaria, the city's destination for tourists. Choose from a private en-suite apartment with kitchen, a spacious family room with double bed and sofa bed, three more private en-suite rooms with wardrobes, and a luxurious dormitory with a balcony and five quality large single beds (not bunk beds!). Each room has lockers, cupboards, bedside tables. -Cancellation policy: 48 hours before arrival. -This property may pre-authorize your card details before arrival.